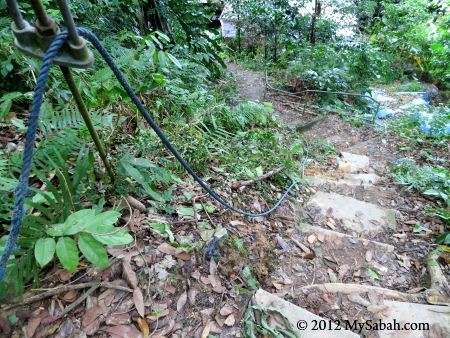 Every corner in Kota Kinabalu city (KK) is under pressure for development, and very few things can survive for one century without being removed. 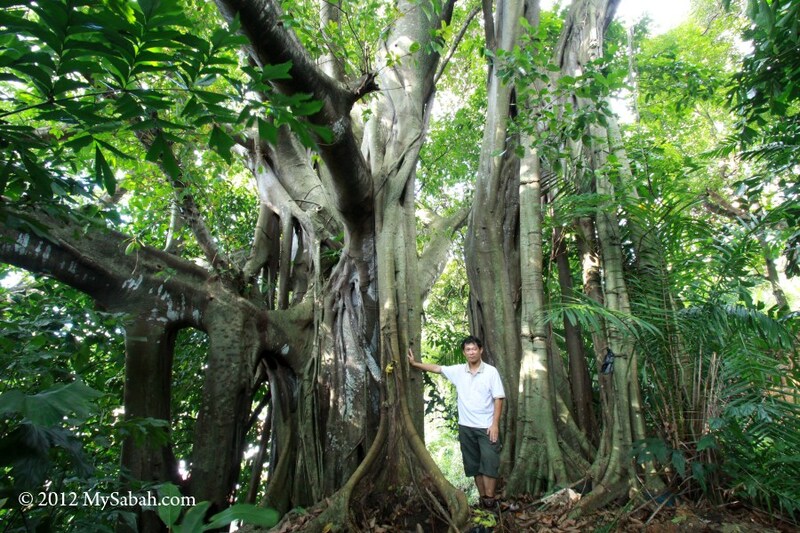 Do you know there is a 100-year-old Banyan tree in KK? 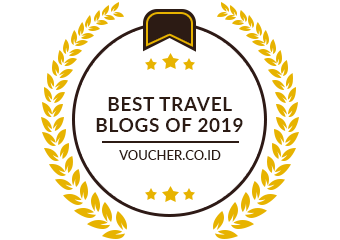 Not only that, it is also the Largest Banyan Tree in KK. I was informed that this giant Banyan is just behind Lucy’s Homestay Backpacker Lodge (near to KK Police Station and Australia Place). 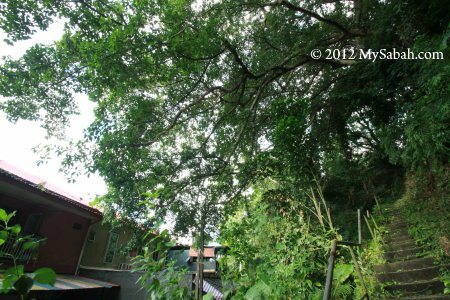 When I was approaching the site, I noticed the lush tree canopy right behind Lucy’s Home, as if there were many trees. 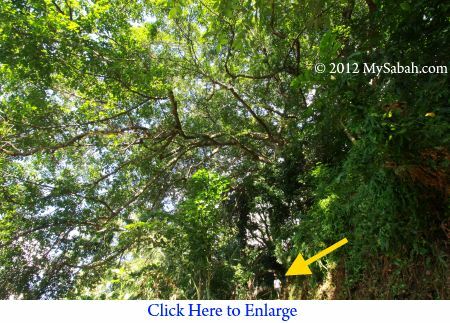 Actually, this dense canopy belongs to ONLY ONE TREE, i.e., KK’s largest Banyan. 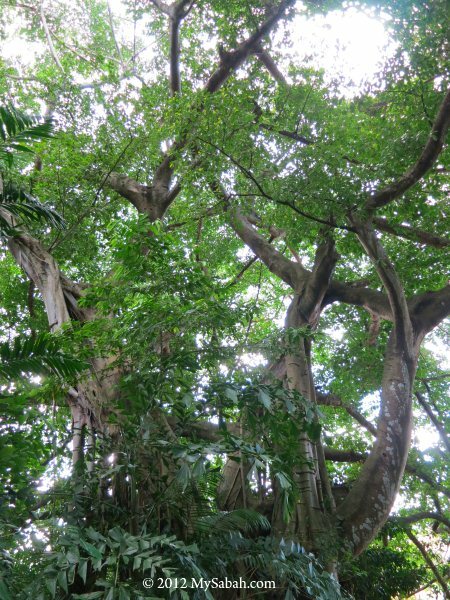 The canopy of this Banyan tree is like a huge umbrella, spreading out 65 Meters across. Banyan trees are the largest living trees on Earth. Pic: I took a photo under the tree. See how small I was? As the tree was too big to fit in one frame, I had to setup my camera and tripod far away, then ran 10 Meters upstair to position myself under the tree, before the timer counted to zero. The camera always shot prematurely, so I had to keep trying. I was so tired to repeat. Luckily I got an aunty to press the shutter for me. 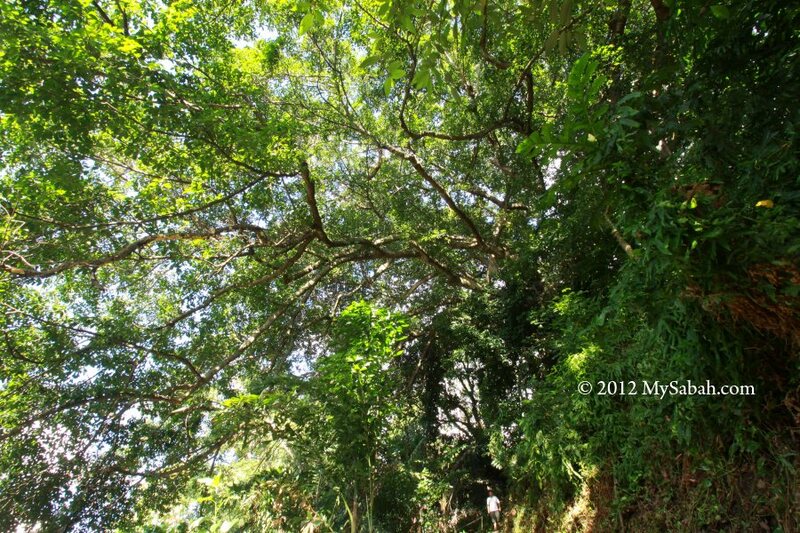 Pic: This Banyan is Ficus tree with heavy branching. Its odd shape and uneven bark surface give it a mysterious character. 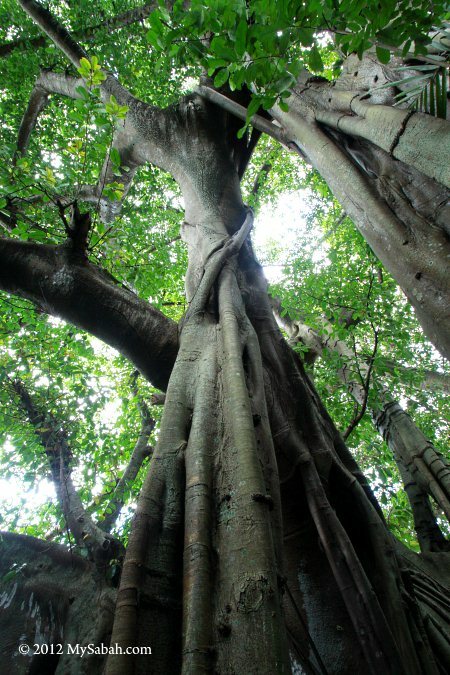 In Asia, Banyan is always linked to religions and spiritual world. Some cultures consider Banyan as a sacred tree (FYI, Buddha’s Bo Tree is also Banyan), others think it houses evil spirits. 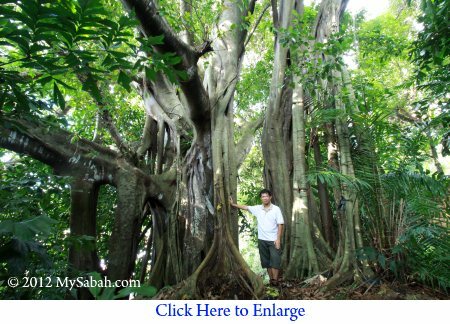 For Sabah, Banyan can be a haunting tree, wishing tree, shade tree and even love tree. Anyway, this large Banyan is definitely a heritage tree that witnesses the growth of our city. However, I don’t think this Banyan is labelled as a Heritage Tree. Hope KK City Hall will gazette it under City Law, so nobody can cut it. My late grandfather was used to have a big Banyan tree outside his house. He said sometimes he could see white human figure with pointy hat, climbing up and down Banyan whole night long. 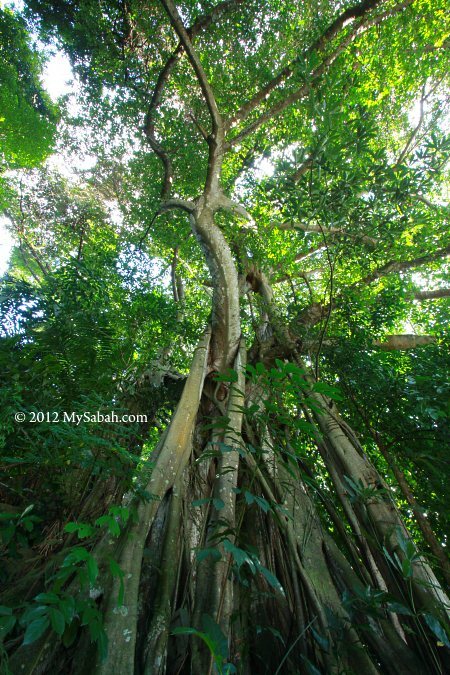 In Sabah, you can hear many ghost stories related to Banyan. Pic: It’s me standing next to this Banyan. I couldn’t smile because I sweated profusely and attacked by dozen of mosquitoes. 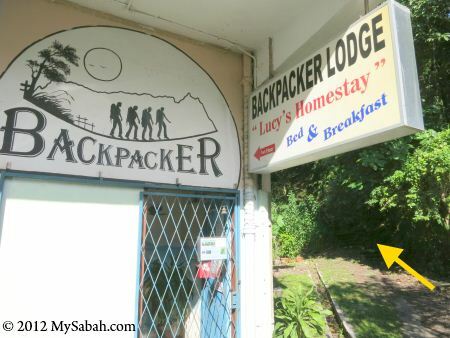 Do bring insect repellent with you for the visit. I estimate this tree is about 15 Meters tall. Though it was a bright day in the city center, the shade and noisy cicada of this tree made me felt like inside a deep forest. The branches of this Banyan haven’t touched the building, but it’s root network has reached the shoplot, a local said. 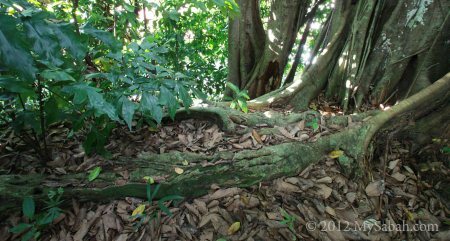 The root of Banyan can stretch 200 Meters. 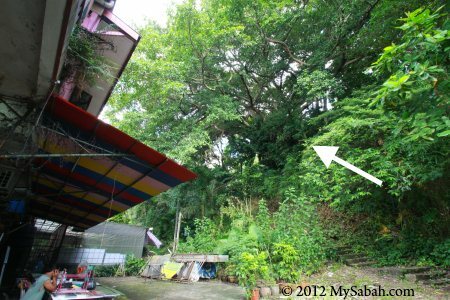 Pic: The walkway next to this Banyan is the Oldest Track of Kota Kinabalu. 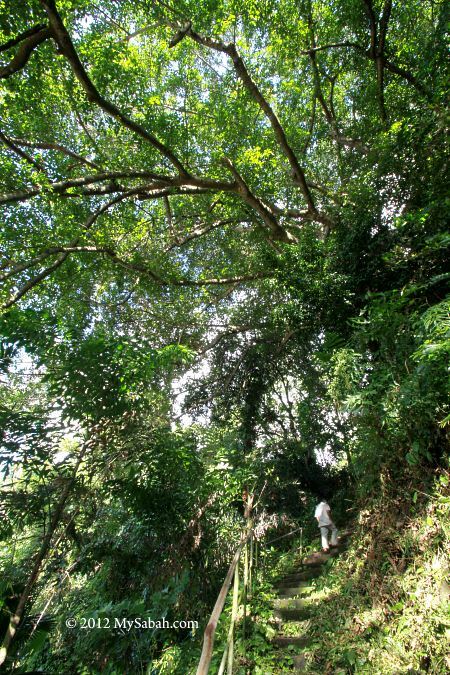 Walking up this historical trail will bring you to a paved road to Signal Hill Observatory Tower, where you can get a nice view of KK city. My advice is – don’t go to that tower alone during quiet hours. Pic: part of the track needs proper maintenance to be safe. Credit: I would like to thank Outreach Ecology (Tasmania) for sharing the information of this Banyan with the community. 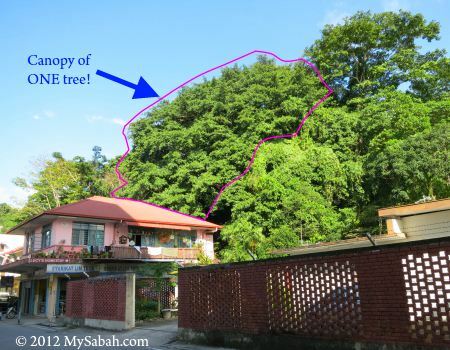 However, there is no official record to prove this tree is really 100 years old, otherwise it can be the Oldest Tree of KK too.